Crafted from the highest quality stone and slate, our stone fire surrounds add an air of subtle grandeur to your home. They also help to create a wonderfully cosy feel to your fireplace, especially thanks to their authentic Victorian designs. Incorporating burnished metal elements with fire proof slate and rustic stone, they will look wonderful in any living space – from modern apartments to rambling country houses. Though you may not believe it given how well they have been preserved, our beautiful stone fireplace surrounds have been carefully removed from centuries-old buildings. As such, they contain some gorgeous details that are beautiful relics of the elegance of a bygone age. 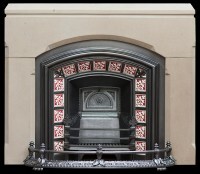 Take a look at our slate and stone fireplace surround taken from a former Victorian schoolhouse, for instance, and enjoy the wonderfully patterned tiles and expertly worked metallic flourishes. These stone fire surrounds would work very well as centrepieces to a room as they are works of art in their own right, as well as being extremely useful additions to your home. If you are tempted by our stone fireplace surrounds, do not hesitate to drop us a line to find out more about them or to make a purchase. Alternatively, feel free to take a look at the other fireplace surrounds that we offer. These include magnificent marble surrounds & cast iron surrounds that look extremely impressive when installed around your grate, and lovely ornate wood fireplace surrounds (that are, despite the material that they are made from, safe to use around fire). We also offer a comprehensive selection of grates and other accessories for creating a handsome looking fireplace.